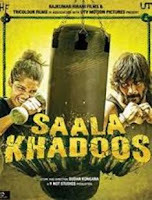 Saala khadoos song lyrics. This song is sung by Sunidhi Chauhan, composed by Santhosh Narayan while lyrics are penned by Swanand Kirkire. झल्ली पटाका हूँ पटाका आ..